The commitment to fiber optic technology has spanned more than 30 years, and nowadays a high level of glass purity, fiber optic cable, has been achieved owing to the continuous research and development. This purity, combined with improved system electronics, enables to transmit digitized light signals over hundreds of kilometers with high performance, offering many advantages in fiber optic systems. This text provides an overview of the construction, categories, and working principles of this fiber optic cable. Fiber optic cable generally consists of fiver elements : the optic core, optic cladding, a buffer material, a strength material and the outer jacket. Here, much more detailed information is attributive to the optic core and optic cladding which are both made from doped silica (glass). The optic core is the light-carrying element at the center of the cable, and the optic cladding surrounds the optic core. Their combination makes the principle of total internal reflection possible. Besides, a protective acrylate coating then surrounds the cladding. In most cases, the protective coating is a dual layer composition: a soft inner layer that cushions the fiber and allows the coating to be stripped from the glass mechanically, and a harder outer layer that protects the fiber during handling, particularly the cabling, installation, and termination processes. This coating protects the glass from dust and scratches that can affect fiber strength. There are two general categories of fiber optic cable: single-mode fiber (SMF) and multi-mode fiber (MMF). MMF was the first type of fiber to be commercialized. It has a core of 50 to 62.5 µm in diameter much larger than SMF, allowing hundreds of modes of light to propagate through the fiber simultaneously. Additionally, the larger core diameter of MMF facilitates the use of lower-cost optical transmitters (such as light emitting diodes or vertical cavity surface emitting lasers) and connectors, more suitable for relatively shorter-reach application. Take 1 Gigabit Ethernet (GbE) applications for example, MMF is deployed to establish 550m link length with 1000BASE-SX SFPs (eg. Cisco Meraki MA-SFP-1GB-SX). SMF, in contrast, has a much smaller core, approximately 8 to 10 µm in diameter, which allows only one mode of light at a time to propagate through the core. It’s designed to maintain spatial and spectral integrity of each optical signal over longer distances, permitting more information to be transmitted. 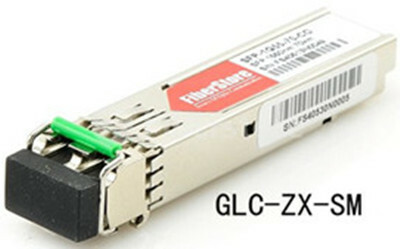 Similarly, as for 1GbE applications, SMF is able to realize 70km reach with 1000BASE-ZX SFPs, like GLC-ZX-SM, a product compatible with Cisco listed in Fiberstore. The operation of a fiber optic cable is based on the principle of total internal reflection. Light reflects (bounces back) or refracts (alters its direction while penetrating a different medium), depending on the angle at which it strikes a surface. This principle comes at the center of how fiber optic cable works. Controlling the angle at which the lightwaves are transmitted makes it possible to control how efficiently they reach their destination. Lightwaves are guided through the core of the fiber optic cable in much the same way that radio frequency (RF) signals are guided through coaxial cable. The lightwaves are guided to the other end of the fiber being reflected within the core. The composition of the cladding glass related to the core glass determines the fiber’s ability to reflect light. That reflection is usually caused by creating a higher refractive index in the core of the glass instead of in the surrounding cladding glass, creating a waveguide. The refractive index of the core is increased by slightly modifying the composition of the core glass, generally by adding small amounts of a dopant. Alternatively, the waveguide can be created by reducing the refractive index of the cladding using different dopants. In fiber optic cables, the light can carry more information over longer distances than the amount carried in a copper or coaxial medium or radio frequencies through a wireless medium. With few transmission losses, low interference, and high bandwidth, fiber optic cables are the ideal transmission medium. Fiberstore offers various kinds of fiber optic cables, including SMF and MMF types, simplex and duplex fiber optic cables, indoor distribution cables and outdoor loose tube cables, etc. For more information about fiber optic cables, you can visit Fiberstore.